I was recently invited to go along to Strip the waxing bar, located in Soho – the salon specialises in all sorts of waxing and actually manages to make one of the least enjoyable beauty treatments actually pretty good fun. I know, that’s hard to believe – but trust me, it’s true. The salon uses hot wax (that looks and smells like chocolate) meaning no faffing around with fabric strips – the wax is applied directly to skin, and then pulled off in a single piece. Prior to being applied a skin oil is applied so the wax clings to the hair, not the skin – meaning less pain. I can vouch for it – it is far less painful. Hot wax in general is less painful than strip – so given the choice I would recommend going with hot. The treatment I went for had an unusual twist to it – it wasn’t just a wax, but a wax followed by a spray tan. I haven’t before come across a salon that offers both in the same treatment slot – which is always quite frustrating when it comes to pre-holiday/special occasion pampering sessions as they usually have to be split into two. But as the therapist pointed out – as long as the hair follicles that are exposed/sensitive are protected then there is no reason why you cant do both. So happily I came away from my treatment fuzz-free and a bit of a golden glow (the glow started to fade after around 5 days). I adore beauty treatments, but I think that a wax and spray tan treatment are the easiest way to get a big confidence boost and it’s just fab that there is somewhere that finally offers them both in one treatment. Strip also includes a rather cute boutique where you can stock up on some pretty undies to compliment the glow. 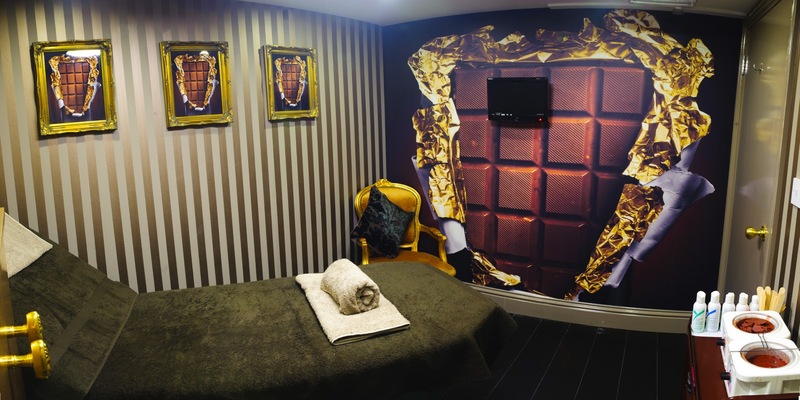 In addition to the chocolate room, there is also an olive room (smells of olive and with olive wax) and a berry room (again, smells of and uses pink berry wax…) you get the theme. You can pick the wax you want – plus there is a more masculine one designed for men. For details of prices and treatments available at Strip then you can visit their website. This looks like my ideal room… if only I could live there. I’ve noticed there are a lot of places popping up that are turning traumatic waxes into pleasurable experiences – defo a winner in my book. I’m gonna check this out pronto. Prices start from £22 for a basic Bikini upto £50 for a hollywood wax, we can offer a 20% discount for first time clients also.